Justuno is a conversion optimization platform that enables your business quickly implement high-converting website pop ups, email signup forms, and banners for email lead capture and sales conversion. With a professional drag-and-drop designer, powerful marketing segmentation, and an integration with SendPulse, Justuno has everything you need to build your email list and increase traffic conversion. Why Integrate SendPulse and Justuno? Connecting Justuno and SendPulse enables you to automatically export contact information captured through Justuno into the SendPulse list(s) of your choice. But things don’t stop there. Justuno also allows you to build SendPulse forms and add form fields during the design process. The end result is a high-converting email signup form that automatically syncs with your SendPulse database. You will need to create a Justuno account first. Follow the steps outlined in this integration guide. 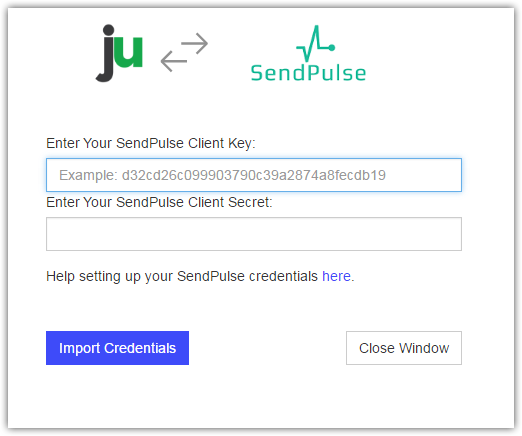 How to configure SendPulse integration for Justuno read in this guide.